This page is dedicated to SDIY (aka Synthesizer Do It Yourself). When I was a teenager, back in the seventies I became fascinated by those weird sounding machines with those huge panels full of blinking light bulbs and knobs. My first encounters with music produced by Moog synthesizers were two radically different pieces: Popcorn (by Gershon Kinsley) and the original soundtrack of Clockwork Orange (by Wendy Carlos). This was really weird at this time but I sure knew that I liked that very much! The music I was listening to was that of bands like ELP, Genesis, Pink Floyd, Yes and so on... Then the Germans came ! Klaus Schulze, Tangerine Dream, Popol Vuh, Kraftwerk, Ash Ra Tempel : fascinating, hypnotic and repetitive. 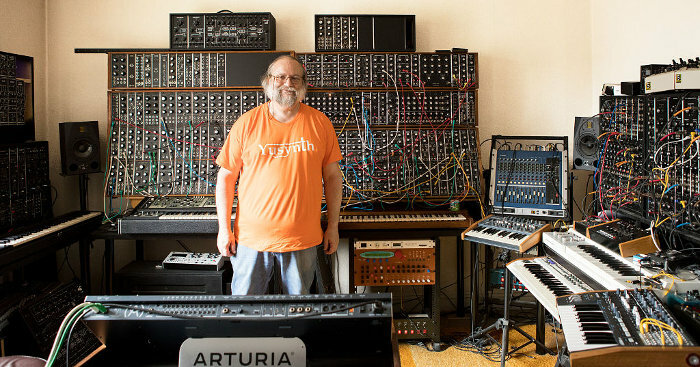 In parallel, some other really interesting musicians extended the realm of synth creativity : Tim Blake, Brian Eno, Jean-Michel Jarre, Vangelis and others. At the time, I had this hobby of building electronic circuits (mainly for short wave listening) and it became obvious that I had to build myself one of these big modular thing. Well, considering the fact that I had no money, this was a very optimistic goal. I eventually managed to build a modest modular synth (US1). Then I discovered computers, I bought a Sinclair ZX81 kit and started programming. This took me away from SDIY for about 25 years! Back in 2000, while surfing on the net, I accidentally came across a site dedicated to SDIY. And that was it ! I was bitten again by the virus ! By the way if you care to listen to some relaxing cosmic music don't miss visiting the site of my long time pal Christian AKA AlphaLyra. And, if you're in love with modulars and analogue keyboards you ought to visit the incredible collection of a good pal of mine, Olivier Grall ! - My synths : this page describes the synths I built and those I purchased between 1979 and 1980. A lot of schematics and pictures are available. - Hints & Tips : Some useful technical infos when one comes to build analogue synths. By the way, I am no native English speaker ! Therefore, you may find a lot of misspellings and stylistic nonsenses. In such a case, please send me an email pointing at these mistakes and I shall correct them.